If Steve Jobs has seemed impatient waiting for Photoshop to come out Mac OS X native, then imagine how the rest of us feel. We’d be happy just to have it open in Aqua, and be a Wet Version 6. But Adobe can’t usher out a mere OS X patch for the world’s seminal design and imaging application. It can’t just be a warmed over version of the same old thing. Well, Photoshop 7 is here, and it isn’t just a warmed over version of Photoshop 6. And it’s not really here yet either. 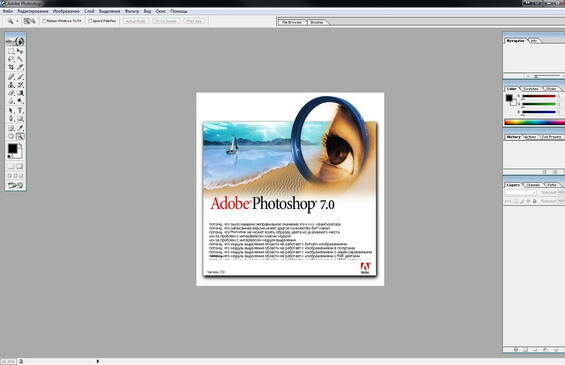 Sunday, February 24th Adobe announced the release of Photoshop 7, coming to your desktop in a month or so. While not available yet, Adobe promises to ship the app by the second quarter of this year. That means another month. But we’ve had our greedy hands on it already, and we’re prepared to give you a little insight. New features and new tools have amped up the application’s power to a new level, and both professional and consumer users will be glad. OS X native, fast and stable, this new version of the app has added some of the most sophisticated and powerful features I’ve seen in any of the previous versions. The watchwords for this newest version are Elegance, Integration, and Workflow. The elegance is found in a set of new tools; Version 7 integrates over a new fleet of Adobe applications, all OS X native, and workflow will increase with easy drag and drop, import and export between Photoshop, InDesign, and Illustrator. 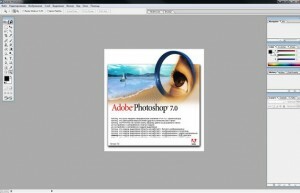 The Photoshop 7 development team has adjusted its sights somewhat and taken a closer look at real world workflow solutions and how to open up the full power application to a larger audience, while maintaining its seat as the de facto standard and mother of all digital imaging applications. The team has done its work well, and they have succeeded. The first thing you’ll notice is a new icon on the tool palette, shaped something like a band-aid. The so-called healing brush may just turn out to be the most popular retouching tool in Photoshop’s history. The tool works similar to the rubber stamp (we in the biz also call it the cloning tool) in several ways. Mind you, the cloning tool is still there, but it’s been bumped down one tier on the tool palette. Here’s how the Healing Brush works. You target a source area with an option-click, and then drag your cursor over the area you want to change. Only this is a cloning tool with a difference. Rather than merely cloning source image material directly onto your image, it adjusts for light values, color values, hue and saturation, and melds the new image info seamlessly on the area you want changed. You can also choose to make the source aligned or non-aligned, with a conveniently placed checkbox at the top of your workspace window. It may sound like subtle enhancement on the older cloning tool, but wait until you try it. This is not just an esoteric rarely to be used new feature; it’s a real-world daily-use tool. The time saving and problem solving ease that the healing brush affords is close to miraculous. Along with the healing brush comes its little sibling, the patch tool. This tool uses the same color value and level matching technique as the healing brush but, with some important differences. The tool is a strange mix of the lasso tool and the healing brush. Rather than option-clicking on a point and then applying in an aligned or non-aligned fashion over a different area, the Patch tool lets you select an area and simply drag it over the new area to be changed. The image information of the source area is applied to the changed area, but now its values match the new site. I shouldn’t forget to mention that you can use one file for source and another for target, swapping image data from file to file without having to copy and paste. The combination of the healing brush and patch tool are enough to justify an upgrade right there. But, as they like to say on those annoying abdominal machine commercials, "wait, there’s more". The workspace organization is also different. The upper right area of the menu bar now includes a "palette well". This area lets you dock your various palettes (and there are many) into a nice neat area, without having to turn them off and then go searching for their sometimes obscure names in the drop down menus above. Among the first new things that you will notice in this well is a brand new tab that says "File Browser". This new organization tool is one of those things that is so obvious and important you wonder what took Adobe so long to finally implement it. We’ve had stand-alone apps that have done image and file organization and cataloging for some time. IView Media Pro is a real favorite of mine for some time. And Extensis’ Portfolio (which has coincidentally just been released this week as OS X native) is a robust and important file organization tool. Photoshop’s File Browser is not, at this writing, as complete as either of those stand-alone’s, but it is a convenient new feature all the same. The palette can be accessed directly from the Palette Well, or you can tear it off and use it as a large window in front of your workspace. The File Browser consists of four panes. Three down the left column and a large preview pane to the right, sort of like the iTunes/iPhoto layout, or more like the Suitcase 10 interface. The upper left pane called the "Tree pane" lets you navigate through your hard drive, while the "Thumbnail pane" on the right will simultaneously show you the contents of each folder. Just above the Thumbnail pane is the File Browser menu, similar to most Photoshop palettes with its drop down menu of commands. The lower two panes on the left remain null until you either choose a particular file or folder within the preview pane. Once you light upon an item in the preview pane a preview or icon will appear in the middle left "Preview Pane". If the item is an image file, the bottom left "Metadata Pane" will fill with specific information about the picture. Name, date modified, colorspace (RGB, CMYK, etc), resolution, file type, what device captured the image, light source, and much more information than you would have thought the little file ever contained are all there for your perusal. Heck, it’ll even tell you if your flash didn’t fire when the photo was taken. Another time saving device, images can be rotated in preset 90 degree increments from within the File Browser. So you can do basic orientation manipulation even before you open the actual file live into Photoshop. Interesting to note, the image itself is not actually rotated, but a small scripting code native to Photoshop only has been added to the image file. So if you rotate the image through the File Browser but then open it instead from another application, like Fireworks, you’ll find no rotation has occurred at all. The orientation manipulation is specific to and works only from within Photoshop itself. All rotation and sorting commands are also available at the bottom of the Thumbnail pane, with button clicks. Image files within the preview pane can also be annotated with "Rank" text. The engineers must have spoken with someone who likes to work on a light box, because the term "Rank" might mean something to photographers and art directors. For the rest of you out there, they may just as well have called it "Notes". Either way, this small feature will let you type in anything you want about the file, in order to help you organize your photos. One major drawback to the File Browser at this writing is that the catalogs cannot be printed directly from within the application. The development team at Adobe has been apprised of this but we may have to wait for the first upgrade patch before that’s rectified. The preview pane can also be used to navigate and drill down further in a nest of folders. Double clicking on a folder will bring you down one level deeper. If that next level contains images, then the preview will populate itself with previews. While the particular new feature tools are important, Version 7 touches on another aspect that may be just as essential. Adobe now has a complete OS X fleet of publishing products ready to go. And each of these has an increased and unprecedented cross application interface integration from one to the next. Photoshop, its little sister app ImageReady (which comes with version 7 as well), InDesign 2.0 and Illustrator 10 are the most important step toward OS X completeness yet. Now, don’t get your hopes up too high. There are still some bugaboos that have to be ironed out, but this suite of applications may have put Adobe back in front of Macromedia, and Corel in the OS X usefulness chart. Drag and drop from Illustrator 10 to and from Photoshop is a reality. Of course, you may lose some things in the translation. For instance, a drop shadow effect applied in Illustrator cannot be removed once it’s inside Photoshop. And getting larger Photoshop objects into Illustrator works sometimes and at others doesn’t. But that may simply be a function of memory. In conjunction with InDesign 2.0, however, where you can drag and drop or simply place native layered Photoshop and Illustrator files right onto your page, your workflow speed should increase dramatically. And Adobe may have some Quark converts if they can get all these applications into their hands quickly enough, and as a unit. Because from the point you have Photoshop, Illustrator and inDesign, not to even mention GoLive and LiveMotion, together in OS X, you’re not going to be dipping into the OS 9 well very much at all. The Mac OS X environment won’t be as much an issue in the coming months as these applications take hold, and we spend all our time avoiding Classic mode the way we do annoying relatives at the family reunion. The final word is this: Photoshop 7 is here, and it’s great. Fasten your seatbelts, put your seatback upright and get down to work.